Driverless cars is the latest rage and a lot of research is happening in the field of self-driving cars and related to its security and increasing its capabilities. The most primary concern has always been safety of the car. Ford has also invested millions in its R&D to compete with players such as Tesla, Google and Nissan. A latest patent application from Ford indicates the deployment of drones as a perfect partner to its self-driving cars. 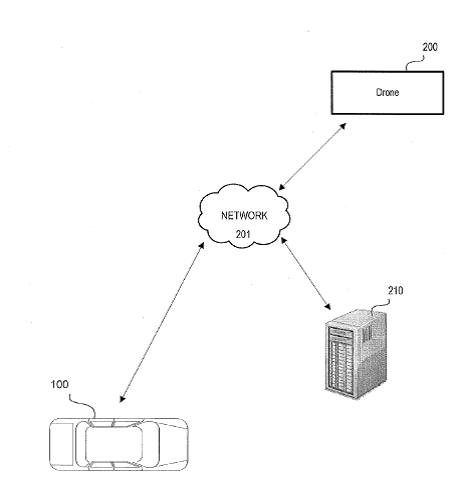 Last week, U.S. Patent Application No. 20160347452 titled, ‘Automotive Drone Deployment System’, was published which talked of using a drone in sync with the self-driving cars. For example, if the fuel light is on indicating the tank being emptied soon, the drone will be deployed to locate a nearest gas station. Similarly, in an area with a difficult terrain and inadequate Map information, the drone can be deployed to identify the best routes and transmit that information back to the car. With the use of onboard sensors and successful deployment of drones, lane tracking, front object detection, rear object detection, blind spot object detection will become easier and hence lead to safety of the vehicle as well as the passengers. Though Ford was a bit late in joining the Self-driving cars race along with Google and Tesla, the idea of Drone Deployment with the cars is unique and sets it apart from the competition. This is a commendable step by Ford, specially from the safety point-of-view. The thought of drones transmitting essential information to the cars beforehand is intelligent.